Many people are under the assumption that core strengthening only consists of sit-ups, crunches, six-packs, and infomercials. There is certainly nothing wrong with this “aesthetic” approach to core training, but, for runners core training goes beyond just washboard abs. A stronger, more stable core can improve your performance and lower the risk of injury. What are your core muscles?? If you ask the common gym-goer, you’re talking about the rectus abdominis – the six pack muscles. For runners, however, the phrase “core muscles” encompasses a little bit more than that. My answer to this question is pretty simple: Everything from the bottom of your chest to your knees, front and back, is part of your core. Core muscles include front and back muscles, from the bottom of your chest to your knees. Abdomen – consists of Rectus Abdominis, Internal and External Oblique, Transverse Abdominis. The primary functions here are abdominal flexion and lateral rotation. 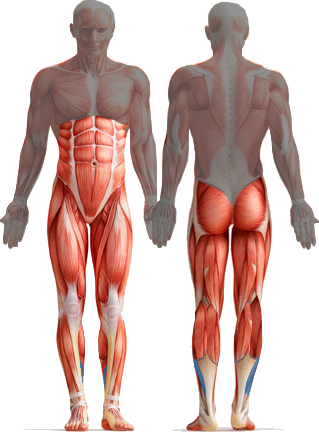 Hips – Made of the Hip Flexor Group (Sartorius and Illiotibial Tract), Gluteal Muscles, and Lower Back Muscles. Primary functions are flexion/extension of the hip, adduction/abduction of the legs, and lateral rotation of the legs.Upper Leg – Consists of the Quadriceps and Hamstrings. Primary functions are extension and flexion of the knee and adduction/abduction of the leg. Upper Leg – Consists of the Quadriceps and Hamstrings. Primary functions are extension and flexion of the knee and adduction/abduction of the leg. As you can see, we have a lot of muscles that work collectively to make up the core. Your core serves to connect your trunk, pelvis, and spine to each other and the rest of the body. These muscles allow us to control movements, transfer energy, and shift body parts in order to move in different directions. The core is our center of gravity and the place where all physical activity originates. Of particular importance, when talking about running performance, are strength and stability of the core. A strong core, first and foremost, will help you stand upright against gravity. It will also produce large amounts of force, which will allow us to do activities such as jump, run, and lift. A stable core, on the other hand, will keep you more balanced throughout those specific movements. Less movement throughout the core will limit stress on joints and lower the risk for injury. It will also allow for more efficient and smooth activity, as multiple muscles and limbs will be moving in unison with less effort. How do we train core muscles? We’ve established that training for runners is more than just sit-ups and crunches. “Well then what is it?” you might be wondering. Well, first off, some running-specific exercises might be a little unconventional. But, if done right, they can be very effective. I’ve provided a list of 10 core exercises that will be very beneficial for any runner wanting to improve performance – 5 that focus on stability and 5 that are more strength oriented. Pick 5 from the list. Perform 3 sets of 15-20 repetitions for each exercise. The key here is tempo. While many workouts emphasize speed, here you want to go slowly and under control throughout the range of motion. This will allow you to focus on using the proper muscles, which will lead to a more effective workout. Do this, and you will develop a stronger core in no time. Core training isn’t always fun. It can take up added time on top of your distance or interval training sessions, but it does pay off. If done consistently, it can significantly lower the risk of injury and improve overall performance. You can watch how to do even more exercises on the BodyFit Punch YouTube channel. Do you already do core training? What exercises do you find most effective or do you look forward to trying? Let me know in the comments below. Great article! Running and strength training don’t need to be mutually exclusive, they can and should be used together. Done correctly strength training is a great asset to runners. Thanks!! I am glad you agree. This is something that I try to remind my clients of on a regular basis. Many people think it has to be one or the other. But, in reality, one can really benefit the other if done properly. Data and Tracks and Filters! Oh My!